Here at Tweetspeak, we take our joking very seriously. We have a name for it, in fact: Self-Fulfilling Comedy. That’s the way Tweetspeak itself and her sister, WordCandy.me were born, really, in the delivery room of joking between friends. This week, comedy fulfilled itself once more. One minute some folks on the team were bantering, and the next we were notifying the calendrical powers that be of our intention to stake out a certain Tuesday in January as Poetry at Work Day. 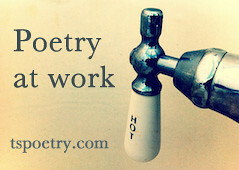 Before we knew it, we had published articles, circulated press releases, and baked chocolate chips into an infographic to announce to the world that we believe poetry is there to be found in our workplaces–whether in an office or restaurant, assembly line or construction site, supermarket or family kitchen. When January 15 popped up on the calendar, we called on you to celebrate with us by finding and sharing poetry at work. Thanks to our kind friends at Huffington Post and Books and Culture, along with a little help from Book Patrol, Publishers Weekly and others who spread the word, Poetry at Work Day found its way into workplaces all over the country. Well, from what we found in our Twitter feed, we think it’s fair to say all over the world. We had more fun than a chicken on a stack of poetry books. Here’s a sampling of how some people celebrated the day. “@huffingtonpost: Happy Poetry at Work Day! huff.to/ZTpL24” isn’t this everyday for you @frescagootz ? RT @kikivonglinow: Rats! 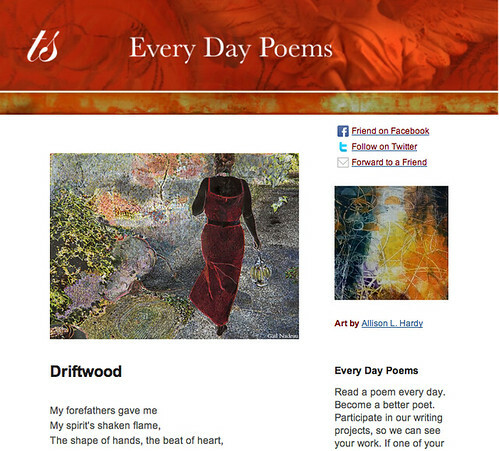 I worked at home today RT @huffingtonpost Happy Poetry at Work Day! huff.to/ZTpL24 / work at home counts! @tspoetry @huffpostbooks @monicasharman @gyoung9751 I celebrated #PoetryAtWork day with Madeline L’Engle’s “The Ordering of Love” at lunch. Anna Broadway wrote a thoughtful article on #workhaiku at Books and Culture just in time for Poetry at Work Day. Some people are ahead of their time, and actually celebrated without knowing it. I want to live in a world where poetry graces the sides of buses, trains, planes and walls. Huffington Post does too: huff.to/Vplqof? Sadly, the chickens ate the cookies we meant to send in appreciation. And to @coffeephilosoph and all those who fretted the slightest bit that they missed the official Poetry at Work Day, we remind you that there is always tomorrow, there’s always next January, and there is always poetry at work. Photo by Mac.RJ, Creative Commons, via Flickr. Post by Lyla Willlingham Lindquist. Buy a year of Every Day Poems, just $5.99 — Read a poem a day, become a better poet. In January we’re exploring the theme Coffee and Tea. I love this. You are making me laugh all over again. So, it’s true: Poetry can be used to conquer the world of work! The first TSP-sponsored virtual chicken to do an Irish jig or perform a Spanish fandango gets to go to the Spam Festival. And make that hen’s spoken word performance the draw for 2014.